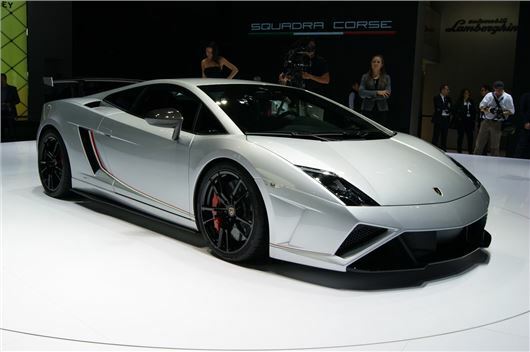 Lamborghini has unveiled its hottest, most focused Gallardo yet at Frankfurt. The LP570-4 Squadra Corse has been developed directly from the racing version, campaigned so successfully in the Blancpain Super Trofeo series. It's powered by a 570PS version of the tuneful V10, and promises to provide a genuine racing car experience on the road. The Gallardo has been around since 2003, and is scheduled for replacement next year, but Lamborghini has no intention of letting it go quietly. The Squadra Corse looks aggressive, thanks to the carbonfibre spoilers, shared with the Performante model, which Lamborghini says achieves the best aerodynamic balance in high-speed driving, generating three times the downforce of the standard Gallardo LP 560-4. The Squadra Corse makes extensive use of carbonfibre, and the results are a kerb weight of 1340kg, and some pretty impressive performance figures: 0-62mph comes up in 3.4 seconds; and 125mph is reached in just 10.4 seconds. Maximum speed is 205mph. These are claimed figures - expect road test figures to best this, and get closer to the McLaren 12C and Ferrari 458 Italia. The interior is similar to the Performante model too, and makes extensive use of both Alcantara and carbonfibre. The underside of the dashboard, the central panel of the seat cushion and the backrest are all swathed in Alcantara, while the door panels, the racing seats and the center console cover are made from carbonfibre. It's also used for the handbrake surround, the centre console, and various other areas. But there's no mistaking the profusion of Audi switches and controls in there, either. The Squadra Corse is available in Giallo Midas (yellow), Bianco Monocerus (white), Grigio Thalasso (grey) and Rosso Mars (red). The luggage cover, front air intakes, rear diffuser and 19-inch forged wheels are painted in contrasting high-gloss black, and look gorgeous - and somewhat more subtle than the current Performante and Superleggera models.